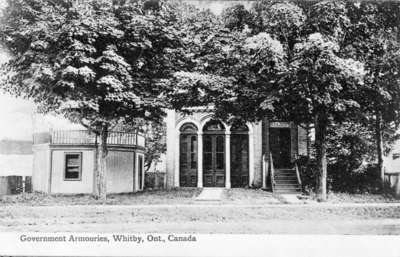 A black and white photographic post card of the Armories in Whitby, Ontario. The armories were located at 105 Dundas Street East, on the south side, between Brock Street and Green Street. The building was constructed in 1878 for the Wolfenden marble works, and from about 1899 to 1946 it was a government armory. The building later became a car dealership and was demolished in 1969. The band stand at left was built in 1906. The Armories, c.1906, Photographer Unknown. Whitby Archives 29-001-024.